The latest US Mint circulating coin production figures for October 2010 reveal the agency was busier than in September, snapping a string of three straight monthly declines. October 2010 levels ranked as the fourth best this year, coming in at 730,220,00 coins minted. However, the level was far below June’s peak when the United States Mint produced nearly 920 million coins. And the pick-up in October was less than the drop-off in September, keeping the downward production trend steep since mid-year. 5,761,450,000 coins were manufactured from January to October 2010. More than 7.1 billion coins will be struck by the end of year at the current pace, which will double the 3.5 billion minted in 2009. The Mint has already struck more pennies this year than all of the coins in 2009. Matching August and September, two denominations were again absent in October. Kennedy Half Dollars continued their silence which started in February. Native American Dollar mintages have remained unchanged since June. The U.S. Mint in Philadelphia produced fewer circulating coins for a second straight month, resulting in production parity between mint facilities. 2010-D and 2010-P mintages are now extremely close or matching for all but the Native American Dollars. 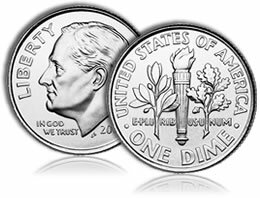 Aside from Lincoln cents, Jefferson nickels and Roosevelt dimes, no additions were made to production totals for coins shown above. However, by subtracting coin design totals from the overall coin production numbers, it is clear that the U.S. Mint is actively producing the final 2010 America the Beautiful Quarter and the last of the 2010 Presidential dollars. 347 million quarters have been made this year, with 278.2 million of those accounted for in the first four releases. Subtracting the numbers, it is presumed that at least 68.8 million have been struck for the final Mount Hood National Forest Quarter, which will be released into circulation on November 15 and ceremoniously launched near Mt. Hood on November 17. Finally, 321.44 million of the Presidential dollars have been produced, with 224.42 of those assigned to the first three issues. That leaves a mintage of at least 97.02 million for the remaining 2010 Lincoln Presidential $1 coin which will get released into circulation on November 18.